Hello! It’s back to normality today for us as the children head back to school after the Easter break. We’re on countdown for the SATs in May – we really just want them to be over with! My daughter has been so busy revising hard this holiday bless her! Not too long to go now! I also used: Kaisercraft rectangle Die, Memory Box Stitched Rectangle Die, ribbon, Spectrum Noirs, patterned papers by Deco Time and the sentiment was created on the computer. What a CUTE card for the Grandad! Happy Birthday to him! 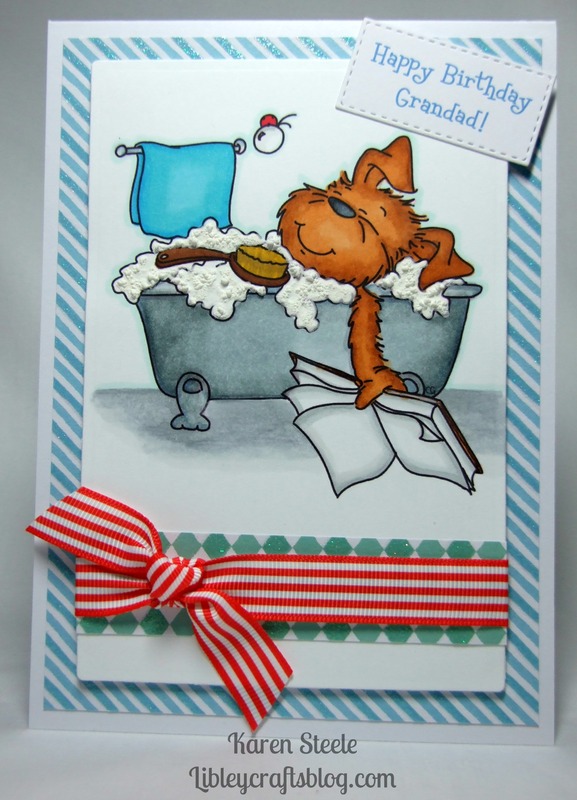 Love the smiley dog and pop of red with the striped ribbon! Adorable – I never thought about using snow for bubbles – clever!! Thanks for the inspiration! Super cute, Karen! Love how you created the bubbles! This type of image is so yo my taste. Lovely clean layout with the red and white ribbon as decorative element and love the texture of the bubbles too.